Whoa super sleep-in – slept too late and missed my Pilates class dammit. Body still detoxing I think as I’m feeling a bit tired and head-achy today. Put on my skinny jeans this morning and was pleasantly surprised to find they were less tight. Let’s just say they were well on the muffin-toppy side 12 days ago. Breakfast & Lunch today were more leftovers – loving having quick easy meals ready as I run out the door in the morning. Tonight I’m heading to a friends house for dinner and drinks, where my brother-in-law who is a top chef is cooking ssam pork with kimchi. I just need to avoid the wine and all the other snack options that will be on offer! 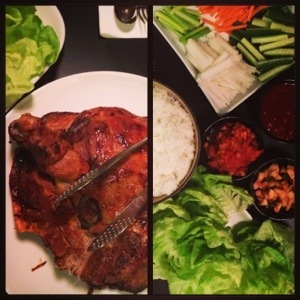 Meal 3 – ssam pork & kimchi – check out how delicious it looks! Previous Post Whole30 – Day 11: paleo restrictive?